How would a hotel look if a jeweller designed it? 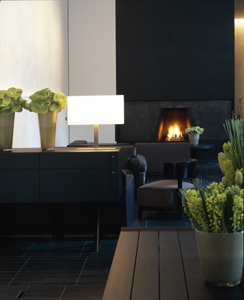 To find the answer, look no further than Milan, where the Bulgari Hotel offers a new interpretation of designer chic. We are familiar by now with boutique hotels, even design hotels, but among the very pinnacle of these are the hotels that are the creations of the finest designers in the world. In an exercise of opulence and a representation of its particular interpretation of hotel chic, Bulgari has created a singular Milan destination that bears the famous brand’s unmistakable look. As one of the world’s two leading capitals of fashion and elegance, Milan is itself suave and sophisticated; a place that is inextricably linked to fashion, design and the creative spirit for which the Italians have gained such repute. It is therefore entirely fitting that one of its most famed and luxurious brands should feel inspired to create a hotel that embodies the very principles that drive its fashion and jewellery trade. Where better to stay and be inspired when in Milan than at the Bulgari? Besides its obvious visual and sensory delights it is the place to inspire you for those shopping forays. The Bulgari is situated close to famous landmarks such as the Duomo cathedral, the elegant Galleria Vittorio Emanuele II and the classical splendour of La Scala, but in spite of this central positioning it also finds itself engulfed in an urban oasis of classical parks. 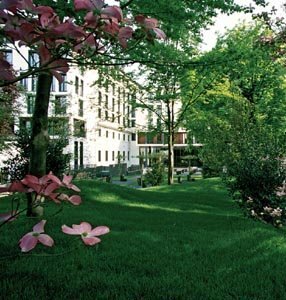 Set upon 4,000m2 of private classical gardens, the estate borders the botanical gardens, ensuring an unusual degree of peace, privacy and space for a city centre hotel. Not surprisingly, given such surroundings, this is the best address in Milan, one characterised by impressive architecture and genteel roads lined with exclusive shops and restaurants. The hotel itself in situated in a grand 18th century building that has been renovated with characteristic Italian flair. Antonio Citterio and Partners, the architects in charge of the remodelling, retained classical elements throughout whilst creating a well-balanced modern canvas for the Bulgari designers to work their magic on. The result is a sumptuous study in understated elegance and refinement in which the senses are nonetheless engaged all the time. Fine furnishings exist in balance with fine art and plush materials such as rare stone and marble specialised sourced throughout the world. Classical elements add accentuating touches to a modern contemporary environment of great warmth and depth, making for suites that are not only comfortable but also engaging. The bathrooms are a particular feature, especially in the rooftop Bulgari Suite where privacy and high refinement are augmented by views over the classical centre of Milan. To make the most of these, the suite also contains a large terrace deck. The Milanese could simply not be expected to stay away from such a venue, which is why the Bulgari’s restaurant and bar are used not only by guests but have also become popular with the city’s business and cultural elite. Here, within an ambience that is also an international style reference, they gather to enjoy a fresh, modern take on Italian cuisine or for an after-work drink at the stylish bar or private smoking room, designed specially for those who wish to enjoy a cigar and liqueur. The only pressure on you will be to match the fashion sense of the hotel, but then again, with so many of the world’s top couturiers at your fingertips you’re in the best possible place to ensure you do. This entry was posted on Wednesday, August 4th, 2010 at 1:28 pm	and is filed under Travel. You can follow any responses to this entry through the RSS 2.0 feed. Both comments and pings are currently closed.